Corbynite group Momentum has dropped its support for Peter Willsman after a leaked audio recording showed the member of Labour’s National Executive Committee (NEC) make “insensitive” comments about antisemitism. The chair of Campaign for Labour Party Democracy (CLPD) had been endorsed by Momentum, as well as other organisations on the Labour left, as a candidate for this year’s NEC elections. Commenting on the decision, a Momentum spokesperson said: “The elected officers of the National Coordinating Group (NCG) have decided to withdraw Momentum’s support for Pete Willsman in Labour’s upcoming NEC election. “While it is welcome that he has made a full apology and will attend equalities training, his comments were deeply insensitive and inappropriate for a Momentum-backed NEC candidate. “Our movement is more than half a million strong and we must hold those who represent us to an even higher standard than ordinary Labour Party members. We must also acknowledge the anger and upset felt within the British Jewish community and reaffirm our commitment to rooting out antisemitism both in the party and across society. Momentum’s national coordinating group decided to withdraw endorsement two days after the Willsman recording was first made public by the Jewish Chronicle on Monday night. It is understood that there was a significant amount of internal wrangling and discussion with Jeremy Corbyn’s office. Momentum chair Jon Lansman, also on the NEC, is thought to have had a tense and sometimes openly hostile relationship with CLPD chair Willsman. There have been divides between the two Corbynite organisations for years, which this latest development has exposed. Lansman, who is Jewish, spoke out on Labour’s latest antisemitism rows in the WhatsApp group in which Momentum members on the NEC liaise with the leader’s office, according to The New Statesman. He described threatening disciplinary action against Labour MP Margaret Hodge, who called Corbyn an antisemite, while refusing to take action against Willsman as a “massive tactical mistake”. But, as Stephen Bush reports, Corbyn’s chief of staff Karie Murphy shut down Lansman and said Willsman’s apology following the leaked recording meant the matter was closed. Corbyn allies are split over the handling of the ongoing antisemitism scandal, with John McDonnell reportedly amongst those frustrated by the approach taken so far. The Shadow Chancellor has also encouraged the party to drop action against Hodge. Members are now speculating to what extent Momentum’s withdrawal of support will affect the NEC election result. For some on the left, the #JC9 has become the #JC8 and those members are either voting for eight candidates only or replacing their vote for Willsman with Ann Black or another independent candidate supportive of Corbyn. NEC ballots started to be sent out to the party membership on Thursday last week, so although voting doesn’t close until 30th August it’s likely that the majority of eligible voters cast ballots before Momentum’s decision was taken. The question is now whether enough members withdraw support from Willsman that Ann Black might be reelected onto the NEC. Yet there has been a significant level of backlash amongst Momentum activists who are defensive of Willsman and keen to stick by the full #JC9 slate. This has brought out into the open some of the dividing lines between Momentum nationally and the organisation as it exists on the ground. Clashes between Momentum factions are often seen as ‘Lansmanites’ versus the ‘Momentum left’. In local groups, the latter have in the past complained about a lack of internal democracy and claimed the national leadership holds too much power, for instance over the endorsement of parliamentary candidates. Of course last night’s decision was made by national officers who are elected by the entire Momentum membership every year, but #JC9ers have tweeted complaints about an ‘undemocratic’ process nonetheless. If the CLPD chair is reelected onto Labour’s ruling body and he is not suspended while the party investigates antisemitism complaints made against him, nobody can force him to resign. If Willsman is not reelected, Ann Black would likely take the ninth place. Labour left veteran Black, backed only by Open Labour this year, was dropped from official Corbynite slates including Momentum after she was accused of supporting the six-month 2016 leadership contest freeze date and overseeing the suspension of Brighton, Hove & District Labour Party. Black has explained that these claims are false, and received 179 CLP nominations in the run-up to the election this summer. But both possible NEC election outcomes are awkward for Momentum. In many ways, this was a chance for Momentum to make a defining statement, as I wrote earlier this week. And the campaign group has indeed grasped that opportunity. 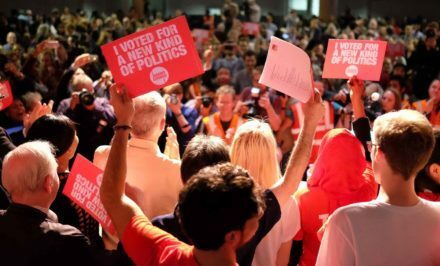 That it has taken this path – seen by many as both the correct moral decision and the most pragmatic electorally – shows that it is willing to disagree with Corbyn’s office at key crunch moments. This arguably says good things about the likelihood it will outlive Corbyn’s leadership and be able to exert influence when it comes to choosing and shaping his successor.